Prime Minister Shinzo Abe continues to say he will try to gain the public’s understanding on the government’s controversial security legislation, but there are few signs that he is winning anyone over. 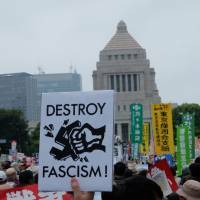 The massive demonstration held in front of the Diet on Aug. 30 is a sign of the times, drawing tens of thousands of Japanese from all generations and spanning the often-divided liberal spectrum. 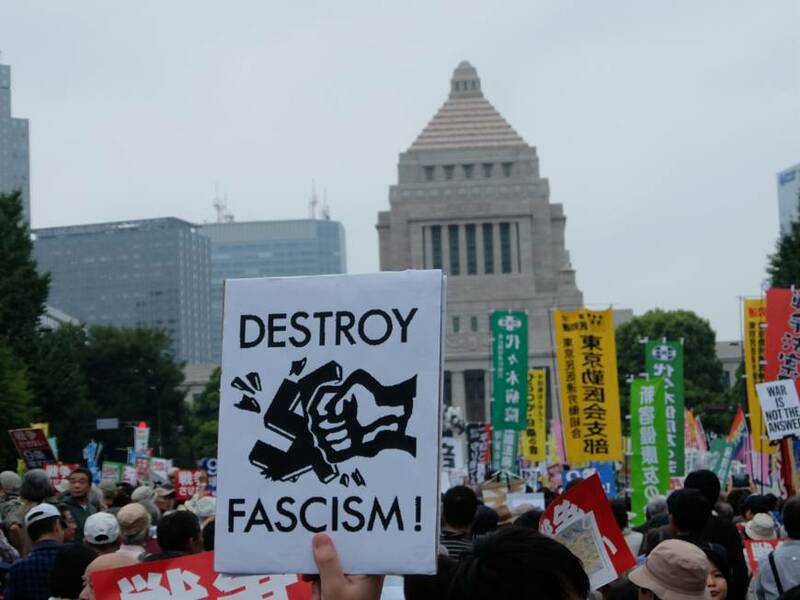 Demonstrators loudly denounced Abe as a threat to peace and the Constitution, while some signs depicted him as a warmongering fascist tyrant and puppet of Uncle Sam. Although “NHK News 7” declared it to be Tokyo’s largest ever demonstration, the program devoted far more time to an investigation into faulty plastic stools. The quixotic Students Emergency Action for Liberal Democracy (SEALDs) has served as an inspiration to the nation, organizing demonstrations and arousing and instigating political engagement extending well beyond university undergrads. SEALDs is part of a continuum of protests by average citizens in response to the Fukushima nuclear reactor meltdowns, the erosion of transparency and accountability — key to any liberal democracy — embodied in Abe’s 2012 secrecy legislation, and government inaction in the face of racist assaults on the rights of resident ethnic Koreans. SEALDs was launched on May 3, Constitution Day, highlighting the group’s concern that Abe’s security legislation is tantamount to a stealth revision that fails to follow proper constitutional procedures. The focus is therefore on Abe’s disregard for the Constitution as he attempts to ease constraints on the nation’s military forces, and the way he is ramming his legislation through the Diet despite it having scant public support. Professor Akihiko Kimijima at Ritsumeikan University says that SEALDs wants Japan to be a nation based on the rule of law, and the group believes Abe is flouting the Constitution, which is the supreme law of the land. Apparently, there is no shortage of Japanese citizens who agree with them. In mid-June, three eminent constitutional scholars dismissed Abe’s security legislation as unconstitutional in Diet hearings, putting wind in SEALDs’ sails. SEALDs is taking advantage of what Sophia University’s David Slater calls a perfect storm of opportunity, and tapping into mainstream anxieties about Abe’s agenda. Slater and his research colleague, Robin O’Day, have been with SEALDs from the outset in an ethnographic project they call “Voices of Protest Japan,” interviewing all the core members and amassing reams of data. O’Day says they are impressed with the resilience and adaptability of the movement, which defy expectations that it might run out of steam. So what does SEALDs tell us about contemporary Japan? Certainly the students challenge the prevailing negative stereotype that youth today are politically apathetic, disengaged and happily retreating into a virtual world. The members of SEALDs are a small vanguard that tap into social networks to amplify their influence and mobilize sympathizers to join in demonstrations. Sophia University’s Koichi Nakano says SEALDs is “trying to build a new political culture” — what Slater and O’Day call “the politics of regular.” Nakano says they are “mainstreaming their message” to reach a wider audience by not staking out an ideological position, because “the Japanese public is allergic to extremism and shuns the radicalism of the 1960s.” SEALDs wants to normalize political engagement and activism, drawing on the recent experiences of Taiwan, Hong Kong and Occupy Wall Street, while interacting with like-minded organizations and counterparts all over the world. Cynics will no doubt be muttering “Good luck with that,” but Kimijima is more hopeful. Douglas Miller, a post-3/11 activist and current graduate student at the University of Washington, is a little skeptical of the current movement. It is striking just how media savvy SEALDs is, with an English acronym, provocative placards in English, an English-language website and good looking youth swaying to the drums while belting out tuneful chants. Meiji Gakuin’s Tom Gill says one member told him that the reason for adopting an English acronym was to make themselves more identifiable to international media. SEALDs sports a cool coat of arms, with a quadrant depicting a book, a quill, a megaphone and headphones with a play button icon in the center, demonstrating a canny sense of branding. Some reactionaries threaten that demonstrators will have a tough time job-hunting, but ad agencies ought to beat a path to their doors. Nakano notes that older leftists complain that ordinary Japanese don’t understand the pithy English placards, but SEALDs embraces a cosmopolitan outlook, connecting threats to Japanese democracy and constitutional government to global developments. At recent protests I asked some older people about a SEALDs placard they were holding that read, “I can’t believe I’m still protesting this s—-.” They fully understood and approved of the message.